Get in touch with our team at SyntecOptics.com for precision manufacturing using impressive five axis machining centers. Our turning services include a wide array of machining processes from facing and contour turning to threading and broaching. Possessing many impressive five axis machining centers with live tooling capability, high pressure through coolant tooling, temperature controlled coolant capability and advanced magazine bar feeders, our premium turning machine tools can maintain a tight precision tolerance of .0001 of an inch on all dimensional features before plating. In addition to our ability to maintain tight tolerances, our superior multi axis turning centers can generate precision machined components measuring up to 6.25 inches in diameter and up to 8 inches in length. Providing the most innovative, high-quality multi axis turning services Wordingham Technologies is well equipped to handle a broad array of machining processes, including but not limited to facing, contour turning, threading, broaching, drilling, milling and tapping. Additionally we offer CAD/CAM programming and design review, cellular manufacturing and print review for new projects. This technology and our innovative thinking enables us to improve processes and techniques to drive down production costs and increase quality for every customer. 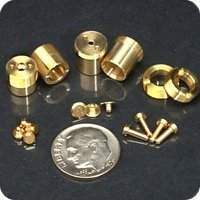 Our premium multi axis turning centers can machine a broad array of plastic and metal materials ranging from nylon, delrin, ultem, steel alloys such as invar and kovar, aluminum, stainless steel and brass. Contact Wordingham Technologies today and learn more about our superior multi- axis turning capabilities and services to meet all your mechanical needs.